Today, I made a pretty grave mistake that made me feel like JetBlue: working so hard for a long time to build your credibility and then thinking that one big error (and bad timing) could ruin that entire empire you’ve built makes you feel like you should hide under a rock for awhile. When I look back upon my particular incident, I see the error of my ways and know what to do from this point onward. I could simply forget what I did, thinking that there’s nothing to fix, or I could opt in for hiding under that rock (it looks cozy over there). But I, like JetBlue, have my own goals to move forward as a stronger person in all areas. (This doesn’t mean that I’ll be posting a video to YouTube though.) My own apology is being posted here in hopes that the people affected are aware of my genuine desire to fix what I’ve broken. My own bill of rights (like JetBlue’s) is to exceed expectations and to improve in any area where I am failing. I think that JetBlue’s ever-so-public apology was received well, and this is my own. We all grow from our mistakes. We get older and wiser. I, like the airline, will take this experience and know that there’s no way to go from here but up. Previous articleI Am Clueless About Your Product. Sell it to Me Correctly. 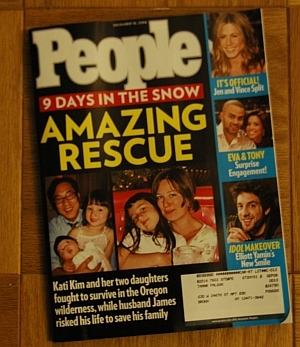 James Kim was on the front page of People magazine this week. I don’t think it would not have been possible if not for bloggers.